Even though exercise provides many benefits for people of all ages, it is particularly beneficial for women after menopause. But while doing any exercise is better than nothing, it can help even more if you do targeted exercises that can relieve menopause symptoms and enhance bone health. One study suggested that when menopausal and post-menopausal women performed exercise, they experienced relief from menopause symptoms. These symptoms include hot flushes, insomnia and night sweats. Other benefits include a reduced risk of osteoporosis and a reduced risk of heart disease. Another study indicated that when post-menopausal women performed regular exercise, they reduced their risk of diabetes. They were also less likely to be overweight or obese. Menopausal women who exercise report improved moods. The 'feel good' chemicals released during exercise are known as endorphins. These chemicals have a very positive effect on moods for anyone, but particularly for women who are grappling with roller coaster moods during menopause. Any fitness plan you perform both during the menopausal transition and after you reach menopause should incorporate a number of different exercises. This will allow you to enhance your flexibility, cardiovascular health and strength while promoting relaxation. A cardiovascular component should focus on raising your heart rate, ideally for twenty to thirty minutes each day. 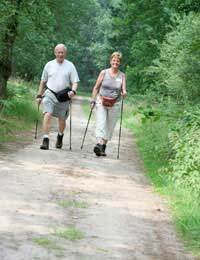 Brisk walking is a healthy exercise with little risks. Skipping rope is a good exercise to help reduce the risk of osteoporosis. Others might prefer to join a gym and try machines at a moderate to high intensity. Running may not be appropriate if you are only just starting as it can lead to a number of related injuries. You should speak to your doctor about whether running is safe for you. To reduce your risk of osteoporosis, you should focus on weight-bearing exercises both during your menopausal transition and after it occurs. The protective effect of oestrogen on bones is lost during these years. Most women will experience some bone loss during menopause, which then slows before accelerating again in a woman's seventies. Full body conditioning with weights is key during this time. It is helpful to use a personal trainer once in a while just to ensure that you are keeping correct form. If you have already been diagnosed with osteoporosis, you will need to be careful and obtain the go-ahead from your doctor because lifting heavy weights incorrectly could cause a stress fracture. Always remember that stretching after exercise is important and can help you improve flexibility and recovery from your workouts. If you are new to exercising, you can start out with small changes in your lifestyle. Simple acts such as always taking the stairs instead of a lift can make a difference in your health. If you feel you don't have time to participate in a full half hour of exercise each day, try breaking this up into ten-minute increments that you perform throughout the day. Alternate walking with driving for trips that aren't far to travel. Yoga uses stretching exercises that can help promote relaxation during menopause. It also enhances flexibility and balance. Done correctly, yoga can stretch your muscles and improve circulation. Another benefit of yoga is that by improving your balance, it can help you to prevent falls. Falls are one of the key concerns for women who suffer from osteoporosis. While treatment for osteoporosis may involve drug therapy and lifestyle changes that include diet and exercise, preventing falls is similarly important. Talk to your doctor if you are starting an entirely new exercise plan during or after menopause. Done safely and regularly, exercise can help reduce menopause symptoms, enhance moods and leave you feeling better about yourself.